Human #2: I've never said that. Human #1: Yes, you did in the post about such and this and that. Human #2: I remember. I didn't say you were a troll. Human #1: You responded after my comment with a picture of a troll. Human #2: That was a GIF about a troll. I didn't say you're the troll. Miao, unbelievable! And, that's how Human #1 replied. One of them, by the way, is a newly elected representative in local government. Which one? What do you think? 1. Are the hummingbirds we see during the winter the same ones we see all the time? Or, are they hummingbirds that moved south a few houses or miles to a warmer mini micro-climate? 2. How many toothpicks can be made from a 18-foot tree? And, from what kind are they made? 3. Why is it that we think we're facing south, but it's actually east? 4. 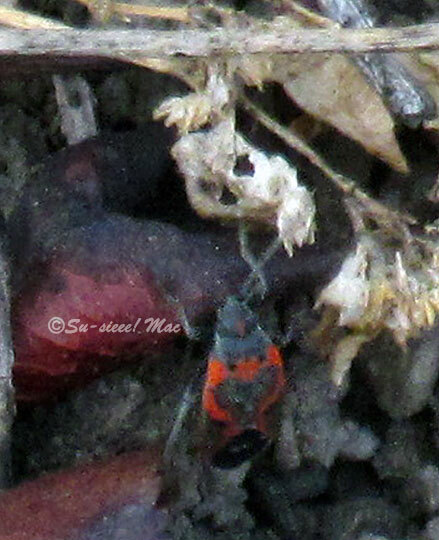 We wonder what the red bug in this photo may be. It's half the size that you see in the photo. A friend wrote that the number one song on our 14th birthday defines who we are. I was game so I looked. Number 1 in the good old US of A: Daydream Believer. Oooh, Peter Tork. He was the cat's meow of The Monkeees for me. Number 1 in the UK: Hello, Goodbye. Hello, The Beatles! Yup. Both songs sound about right for me. So, what was the number one song on your 14th birthday? Key in something like "number one song in (date of your 14th birthday)" into your browser. As part of trying something different, Molly and I are linking up to three memes—All Season, Mosaic Monday, and Our World Tuesday. Please check them out. Thank you, Kind Hosts! Su-sieee!!! Thank you for trying something new and joining Mosaic Monday! So happy! Your post is just the stream-of-consciousness I would expect from you and Molly. LOL. Our fur-baby Maggie used to sleep on her back like that; now I think she's just too old for it. Speaking of old - the number one hit when I was 14 - Stayin' Alive by the Bee Gees. I ADORED the Bee Gees, but I am not sure I want to think too much about the meaning of this … Happy Thanksgiving to you! A cat's eye view. 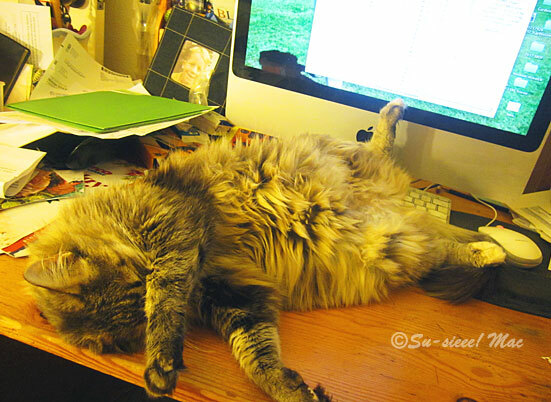 That's how I feel some days,, ready to sprawl out in front of the computer! The Archies and the Beatles, haha. And, I thought the Monkees and the Beatles were incongruous. I remember the Archie cartoon show. My song was “Sh-Boom” — a forgettable bit of nonsense....so yeah, I guess that proves the point. 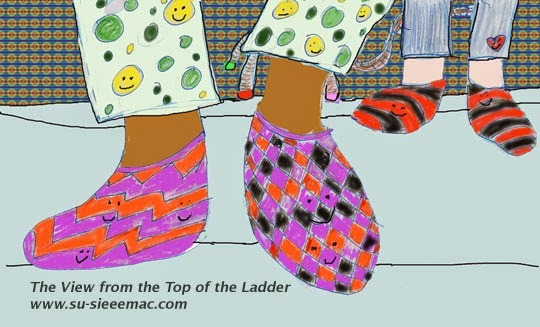 I want the pajamas and slippers in your painting. hahaha. The pjs were actually cotton drawstring pants. They were so comfortable, but, yeah, people thought I was wearing my pjs. Maybe they were. Be so funny if they were. I found them in the Macy's sales rack. What a fun post and great musings from the two of you. We thank you, Madame. Missy says, Purrrrrrrrrr. Most of the songs from my 14th year are kind of dumb! Fortunately the one from the week of my birthday is "Georgia on My Mind," a great one! Fun post and photos. I love watching the hummingbirds too. The kitty has a nice view. I had to laugh at the number 1 song on my birthday it was "I think I love you" by the Partridge Family. Enjoy your day and week ahead. Happy Thanksgiving. Thanks, Eileen. Hahah. David Cassidy with that lovely haircut. A fun post - I enjoyed reading it! Can I fudge just a little and claim the number 1 song of the week before my 14th birthday? - Oh, Pretty Woman by Roy Orbison! Not that I am all that pretty, but I love Roy Orbison songs! Yeah, he had a unique voice, he did. I can hear his version in my head. Rowwr. Love your funny conversations and cute barefooted memories! I'm glad you enjoyed the post, Uppal. Thanks! Joy To The World, which was part of a performance we had for our 8th grade graduation. I liked Peter Tork's hair and for the longest time thought a tuke might really be a Tork because of his hat. Love the spread eagle kitty pose, Molly, comfort is what matters most after all. I do believe I was looking for a kitten sleep mask at one time. That must've been fun singing. I like song. Joy to you and me..
Purrrrrrrr. That keyboard was surprisingly soft. Your conversations make me laugh! ...all I can say is wild socks! 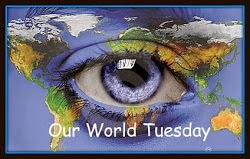 I knew I would enjoy your blog as soon as I saw your banner and read what was on it! What a precious hummingbird and I like the questions to ponder! Happy Mosaic Monday! Thanks, Lavender Dream. Your name has me thinking of Anne of Green Gables. I think there may have been a kindred spirit of Anne's whose name was Miss Lavender. I love that Molly will be joining you. That is such a sweet photo of her. Such fun musings! The drawing is precious. Thankest thou, Soma. Molly's still thinking about whether she wants to share the stage of the page with me. Hey what a laugh my UK song is Manhattan Transfer's Chanson D'Amour that will do nicely! Writing this from the UK, Molly and I have the same approach to life I'm feeling a little jet lagged! I would love to have hummingbirds in my garden! Beautiful hummingbirds. We don't really get many here in New Engaged and even less so where I live. Too cold, maybe. New England has orioles and cardinals which I've always wanted to see since first grade so many eons ago. 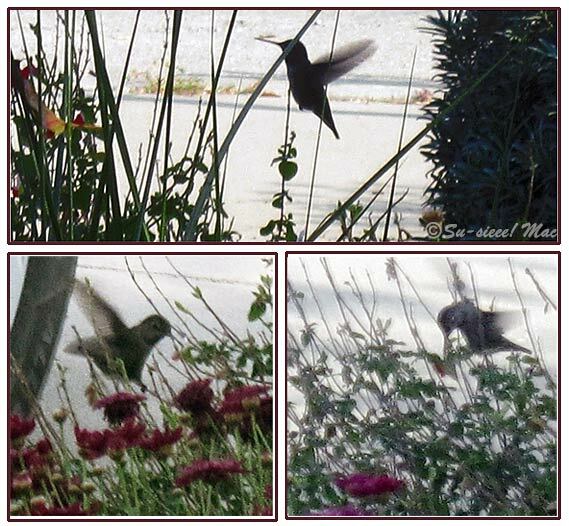 Oh love your new blog look ~ love your Molly photo the best ~ lovely hummingbirds too ~ Molly is the the best! Thanks, Carol. Molly says Purrrrrrrr. She's being nice to me right now by sleeping on the floor nearby. I'm sure it was more trouble to move off the desk than to shield her eyes. Sometimes moving takes too much energy. I'm listening to the song as I write. It's a great youth angst song, lol. Have a happy Thanksgiving, Susie! Thank you. Hope yours was a joyful one, too. It is a dangling conversation. I like. And I like the new header as well. Thanks, Amalia. Skippy, skipping, that is me right now. I love the font you are now using on your blog. Sorry I do not reply to comments on my blog very often, but I need to update my blog more frequently, and thus I am not looking at it as often. Thanks, Julia. As you can tell, I'm back to slow mode. After doing daily posting for a year, I'm still figuring a schedule for me. Or, non-schedule, except that can be once a blue moon. Thanks, Karolina. I'll drop by soon.